After a meeting yesterday, I found myself right beside a River Island so I decided to have a quick look. No trying on I said....not enough time! But then I saw so much I liked and next thing you know, I'm in the fitting rooms. I have really warmed to River Island over the past couple of seasons. I like that they stock lots of jersey and knitwear pieces that are plain/neutral but with a slightly quirky shape. But I have also heard lots of friends rave about their jeans so I was keen to have a quick look at the denim too. 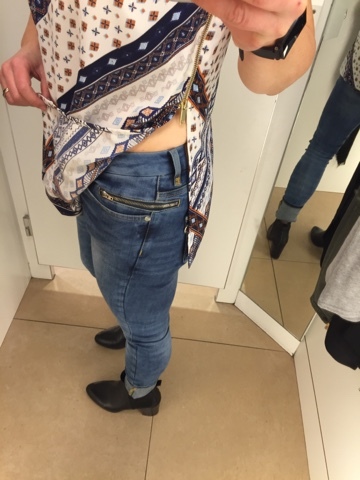 Now I hate trying on jeans. 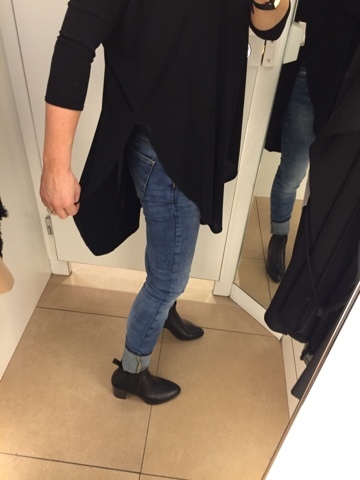 Tops, knitwear or jackets, I can try on all day but what a faff it is to try on jeans on a cold day. 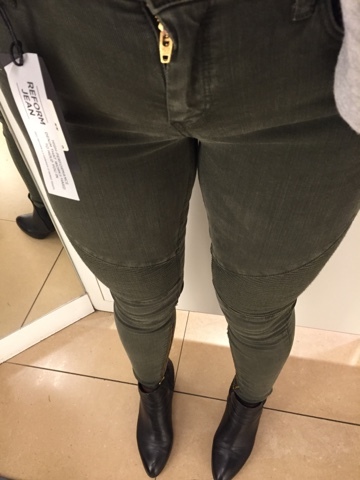 But I saw these biker style khaki jeans in the window and just had to try them. The fit is lovely - I'm wearing the 10 and they are spot on and if you're short of leg as I am, you'll like that they're not too long - I'm wearing the Regular leg though they are probably verging on ankle grazer territory with me so do run short. I love this length for spring/summer but in fact, they also worked really well here with my ankle boots. 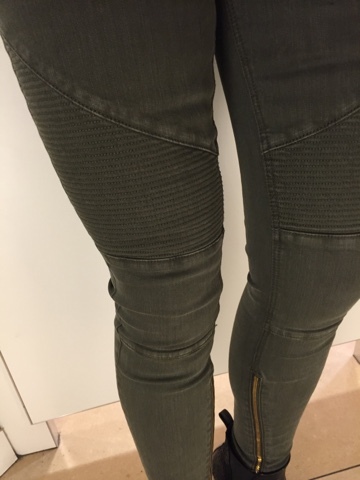 Really loving the zip detail on the inner leg, along with the biker style detailing on the thigh. Next up, it's the grey top I'm wearing above. 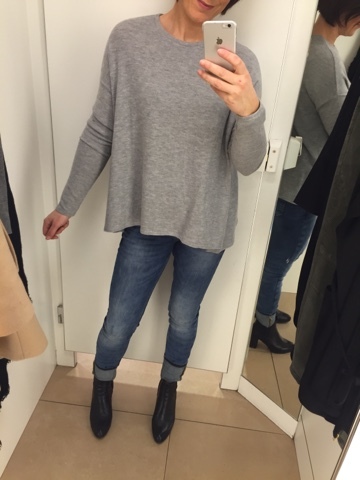 I have this soft jersey top in two colours already and LOVE it. I'll warn you, they do go a little bit ball-ey after washing a gazillion times but based on price per wear, my two owe me nothing at this stage. The style never went into the sale and has been re-released again this season. I have to say that I noticed some difference in the material in these new ones so it's possible they will wear a little bit better. 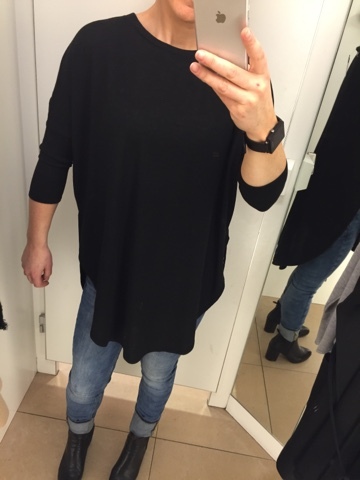 I've been looking all over for a nice black knit that's a bit different in shape and I found it with this one. It's got 3/4 sleeves, a round neckline, a big pleat down the (longer) back, slits up the side and a drapey front. Difficult to photograph because of the colour but you can hopefully get the gist from the pictures and from the website link. I think it's going to be a great one in the summer over skinny white jeans or even denim shorts on cooler days. Then again, I could be totally wrong about that. Let's wait and see if it actually makes it there! I have been on the fence about waistcoats but this one is well priced and I liked the shape so I decided to try it on. I think it looks best with bare arms and a cami underneath so to this end, I would see it working more as going out wear - perfect for covering up a little bit more without the warmth of a sleeved jacket. I didn't like it over a long sleeved top - a bit mumsy looking. 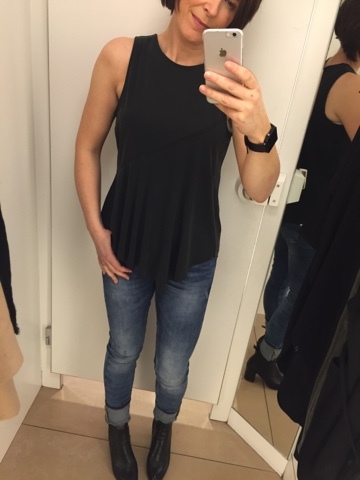 This slightly faded looking black sleeveless top was an instant hit on the hanger but when I tried it on, it didn't quite work. I think this particular one is flawed as the arm openings were completely different sizes with a gaping left arm hole but a perfect right one. Otherwise, I loved it - so flattering on. 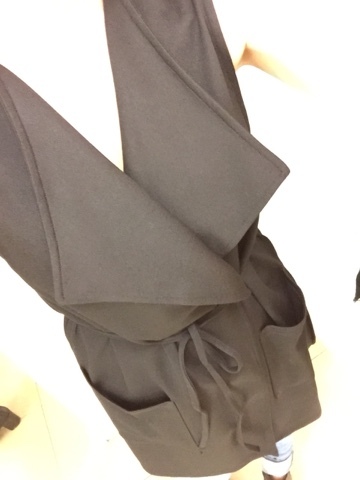 Sadly there wasn't another 10 to try on in the store but I'll watch out for it if I'm in another River Island soon. Can't find it online sadly! 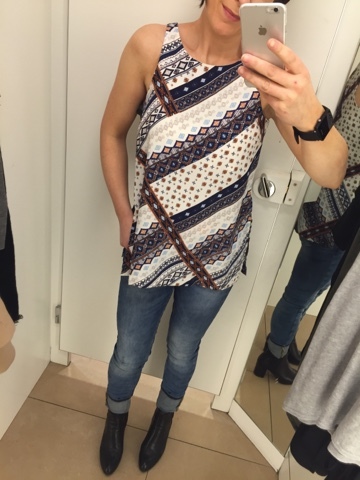 Lastly, a break from the neutrals because I liked the print on this sleeveless top. It's got those annoying cut-away arms that require a strapless bra but apart from that, I loved it....cute side splits (LOVING side splits atm!) and a nice zip detail. 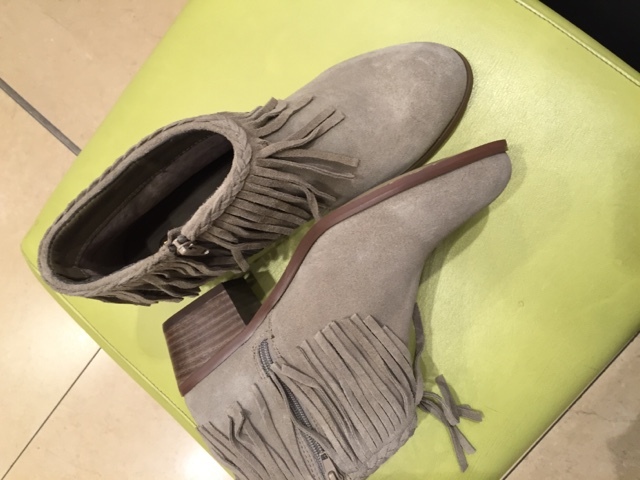 Then as I left the fitting room, I spotted these stone real suede tassel boots for £45. Very nice in real life. Didn't dare try them on. What did I end up buying? 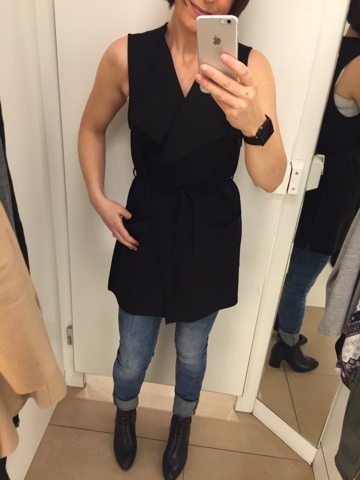 Well, I could have bought it all (if I'd found another black sleeveless top to fit) but budgets only allowed for one item. And it was the black circle jumper. .....though I may have gone back today to get the grey top. .....and I might go back next week for the jeans. Don't judge me and let's hope my husband isn't reading. I'm up and down with RI, I have lost my mind on occasions and brought some hideous print tops ...... Much safer to stay with the neutrals as fine as I'm concerned. 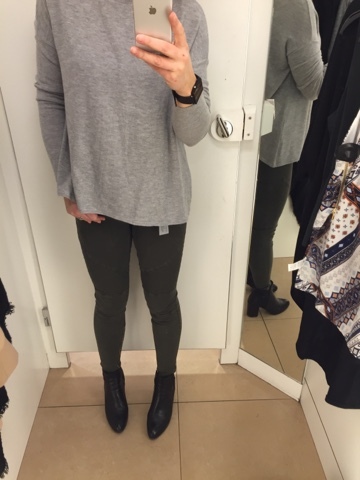 Those biker jeans are fab, be so useful as it gets warmer ..... Whenever that might be! I just ordered the waistcoat! I believe it's THE piece I'm missing (for now). I really appreciate the try ons. I'm in the US, so there's no stores here. I have similar tastes as you and I love that I can now order from loads of UK stores. Haven't tried River Island yet. I do worry about sizing as I'm only 5'2" and tend to be uk 10 in fitted styles and an 8 in relaxed. Ordered the 10. I may even be back for those motos. Thanks again!